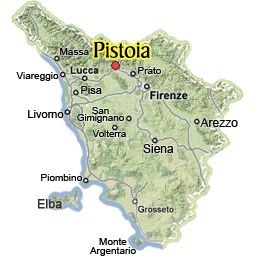 The city of Pistoia is located in northern Tuscany, halfway between Florence and Lucca, about 40 km away from each. The province of Pistoia is quite large, includeing both flat valleys as well as hilly and mountainous sections, including the Valley of the Ombrone river, the Valdinievole and the Pistoia Mountains (where you can go ski!). The area of Pistoia and Pescia is also very well known for the cultivation of plants and flowers exported all over the world, with a long tradition of local nurseries being passed down generation after generation. The small town of Quarrata is known for the production and marketing of quality wood furniture. Thermal baths are another important resource for the province of Pistoia. The thermal baths of Montecatini and Monsummano can boast of waters with beneficial health effects and thus are much sought after by anyone wishing to take care of themselves, as well as treat themselves to spa treatments. These are the thermal baths which hosted nobilty and royalty, as well as more recent movie stars, through the centuries. Outdoors and sport lovers will love the Pistoia Mountains, both in the summer and in the winter, when the ski slopes and lifts are open. The ski resorts of Abetone and Val di Luce are among the most popular. Pistoia is located in the so-called "Tuscan chocolate valley", an area that extends between Pisa, Pistoia and Prato in which we can find some of the most renowned Italian artisan chocolate makers known in Italy and beyond. For children of all ages, we recommend heading to the Zoo of Pistoia (about 10 km outside of the city) and to the Pinocchio Park in Collodi, with its adjacent Garzoni Garden. Both are perfect for spending time outdoors in the spring, summer and fall. The Fattoria di Celle is a beautiful outdoor sculpture garden with contemporary works of art that are part of its environment. If you'd love to visit, make sure to book ahead of time. Among the events that you can find every year, you'll find the Pistoia Blues Festival and the Giostra dell'Orso, or Joust of the Bear, both taking place in Pistoia in July. The joust takes place every 25th of July, on the feast day for the city's patron saint, St. Jacob. Here are some of the main annual events in the city and area. Discover all that Pistoia and its surroundings have to offer around the Christmas season from markets and shows to music and shopping. Cheer up your holiday season by visiting one of Pistoia's many events! Love to feel the crunch under your skis and the wind in your hair as you glide down the snow covered peaks? Just outside of Florence you can indulge in the varied slopes of Abetone, just above Pistoia. From Beginners to Experts, this area is loaded with winter sports activities. If you have a day and want to discover an off-the-beaten track city in Tuscany, head to Pistoia! Explore the city's historical center following this interesting walking itinerary and visit the main sights that will offer insight into the town's history, art and great food. An itinerary for all ages! The center of Pistoia is alive and offers many choices for eating out, from restaurants to trattorias and pubs for enjoying the evening out. Here, I'm sharing my top 5 in the city. You really will be challenged to decide which one, especially if you're in Pistoia only for an evening or two. Buon appetito! Pistoia makes it easy for tourists and visitors to enjoy the city center with free parking lots, shuttle buses, bikes and frequent trains from Florence & Lucca. We have put together the information you need to navigate this great little town. Pistoia offers both classic itineraries and tour to the discovery of its many unexpected treasures. Keep on reading our article to find out my favourite 5 off-the-beaten-track attractions you should visit during your stay in this marvellous city of art. To the discovery of the underground itineraries in the city of Pistoia: a secret passage that once used to connect Porta al Borgo with the Fortress of Santa Barbara. Guided visits and lots of events are often organized inside this suggestive backdrop. The Pinocchio Park in Collodi is for families and for anyone wishing to return to the carefree days of childhood. Here the most famous wooden puppet in the world, along with Cat and Fox and other characters from the famous novel, lead you to discover one of the greatest tales in the world, a tale born in Tuscany. The contemporary artwork in the Marino Marini Museum will give you a new perspective. It is set in the heart of Pisotia, and easy to include in your itinerary. This museum will be will be a major player in Pistoia's new role as Cultural Capital 2017 in Italy. Outdoor activities close to the city of Pistoia. Find your special place to relax in the lush green tranquility located between Florence and Pisa with the kids...or without. It is known that Tuscany is an incredible region to visit, but have you ever imagined reaching Switzerland by driving less than 60 km from Florence? Well, there is a little trick going on...read on for more details! Include a fun stop for the kids, and yourself, while visiting the city center of Pistoia. Among the historic buildings, quaint streets and small shops is a colorful pit stop for the all ages. Outdoor activity in a fresh green park! Saint Bartolomeo Celebrations in Collodi are a unique occasion for visiting the quaint village of Collodi Castello, the Pinocchio Park and the Villa Garzoni, and enjoy the historical parade that winds its way through the old town. Discover Montale and all it has to offer, from its many farmhouses and restaurants to panoramic views and local foods and products. Learn why you won't want to miss adding Montale to your Tuscan itinerary. The mountains above Pistoia are wonderful to explore during the summertime, when you can enjoy magical moments in the woods and forests surrunded by gentle breezes and great temperatures. The Joust of the Bear, Giostra dell'Orso, takes place every July 25th in Pistoia, on the feast day for the patron saint of the city. Read about the history of this ancient tournament and some useful tips to go to see the event today. Every July, Pistoia is transformed into one of Tuscany's musical centers as it hosts the Pistoia Blues in Piazza Duomo. International artists come to Italy to entertain the public, with not just blues music but with rock and folk music as well. Take a look at the program and start planning your visit to Pistoia! A magical place exists in the province of Pistoia, in a place called Santomato. The Fattoria di Celle gives visitors the chance to immerse themselves in the beautiful majesty of outdoor contemporary artworks. In addition to a delightful and characteristic historical center made of elegant piazzas and charming streets, Pistoia also offers all visitors many entertaining events throughout the year. There are many events you will find in Pistoia and surroundings to spend a fun New Year's Eve as well as enjoy an Epiphany full of sweets and gifts for your children, the last of the season!